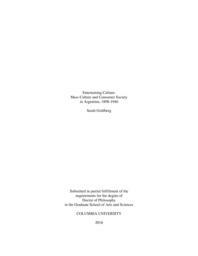 “Entertaining Culture: Mass Culture and Consumer Society in Argentina, 1898-1946” is a study of Argentine mass culture in a new consumer society: a new cultural dynamic that emerged around the turn of the century in Buenos Aires. This dynamic entailed a redefinition not only of the relationships between culture, creators, and publics, but also of those categories themselves. Early twentieth-century Argentine mass culture was a heterogeneous realm of cultural production and consumption in which varied and often conflicting ideologies, aesthetic convictions, and class or party allegiances jostled for purchase, creating a constant push and pull of competing desires and values. Within this context, criticism and ambivalence about the effects of cultural modernization was ubiquitous, a byproduct not only of the heterogeneity within mass culture itself, but also of the tension-filled incorporation of culture into the market. By analyzing Argentine mass culture in this light, my dissertation challenges monolithic understandings of mass culture that ignore how it exposed and grappled with the tensions in its own premises. The cultural dynamic of the period collapsed the categories of culture, consumer good, and entertainment and blurred the limits between production and consumption, often provoking dismay from creators, cultural critics, nationalists, and educators, frequently voiced from within mass culture itself. Mass culture adopted variety as a central premise, claiming to offer something for everyone and for every taste, in a business strategy designed to attract as many paying consumers as possible, and to turn them into brand loyalists. Cultural ventures also used a number of other tools, such as novelty, brevity, immediacy, familiarity, levity, and affordability, to expand their market share through entertainment, providing cultural production that fit the bill and encouraging Argentines to demand these qualities of the cultural production they consumed. Mass culture also encouraged Argentines to view the world through the logic of spectacle, according to which anything or anyone, given the mass cultural treatment, could be transformed into entertainment. While the transformation of culture into a for-profit entertainment venture and a consumer good made it possible for more aspiring artists to make a living at writing or performing, it also provoked frequent criticisms of the industrialization of culture, the mercantilism of producers, the quality of cultural works, and the naïveté of audiences and aspiring creators. To better understand the tensions in play in this new cultural dynamic, I advance the concept of “cultured consumption,” a term I use to identify the dominant ideal of consumption in early twentieth-century Buenos Aires. As a loose complex of practices, cultured consumption was characterized by a tension between competing models of social aspiration: one, based on the performance of gentility and refinement, per aristocratic practices; another, founded upon a middle-class ideal of comfortable domesticity and family-centered values. Thus, by participating in cultured consumption, Argentines asserted their ascription to a certain set of potentially competing values and desires, from upward mobility and good taste to economy and family unity. Furthermore, according to the premises of cultured consumption, purchase of certain products and participation in certain activities would mark consumers as authentically and patriotically Argentine. Nevertheless, it was not clear how Argentine culture was to reconcile refinement and moderation, performance and authenticity, and public and private activity. Cultured consumption was, thus, both progressive and conservative, aspirational and protective of the status quo; in it, standards of taste took on moral and even political connotations. Through it, culture was both democratized and limited according to a set of sometimes competing standards and values. In this way, mass culture promised ever broader sectors of the population that by participating fully in it they could satisfy their heterogeneous desires, experience self-actualization, and improve their lot in life. At the same time, mass culture invoked consumption, spectatorship, and artistic aspirations as possible threats to the stability of the family and social structure to limit the expansion of access to culture and cultural production. Mass culture, thus, set itself up as the articulating joint between public and private life in Buenos Aires: a series of practices that increasingly defined participation in, and an interpretative lens that allowed Argentines to make sense of, public and private life—including mass culture and consumption themselves. Against the limited narratives of the period traditionally proposed by literary criticism and cultural history, this dissertation argues that it is precisely this heterogeneous area of mass cultural production that can help us better understand Argentine culture of the period more broadly: it allows us to see how these tensions played out on a massive scale. Considering cross-object study to be essential for understanding the new cultural dynamic, this dissertation recuperates archival materials and understudied genres such as mass-circulation periodicals, advertisements, reviews, advice literature, recitation manuals, celebrity profiles, and popular plays and music, and analyzes both the texts themselves and the interactions, institutions, and practices around them. This methodology allows me to do two things: first, to put disciplines such as consumer history and media studies in dialogue with literary criticism, theater history, and cultural studies; second, to complicate the narratives of the period traditionally espoused by literary critics and cultural historians. While the former, through their focus on aesthetic and political polemics, largely erased an area of cultural production massively consumed in the early twentieth century, the latter, by portraying culture as tangential to a more important political or economic narrative, deny culture its historical agency. My dissertation, in contrast, considers Argentine mass culture of the period to be not only a cultural dynamic that comprised systems of production, practices, and content, but, more broadly, the mouthpiece of a new worldview that redefined all areas of life. This worldview, originating in the cultural realm, would shape the course of Argentine social, economic, and political history to come. In foregrounding mass culture in this way, I propose a new corpus and lens for evaluating modernization in Buenos Aires.